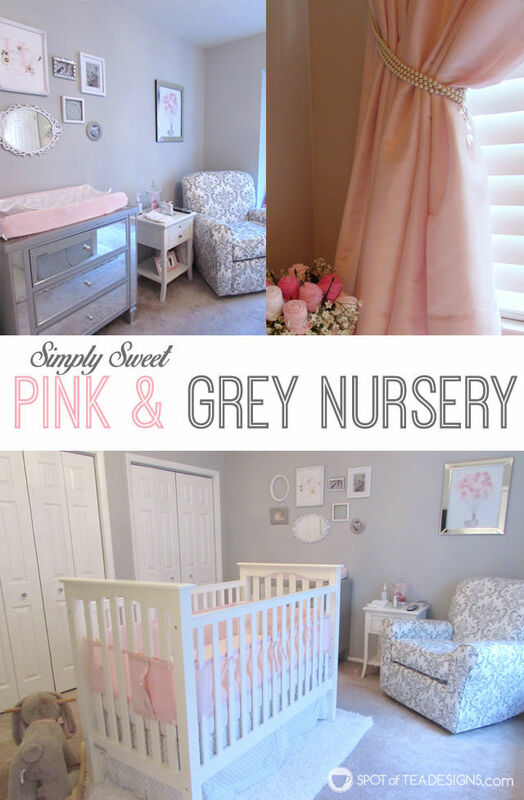 Let’s talk a stroll around this beautifully coordinated nursery for little Harlow! 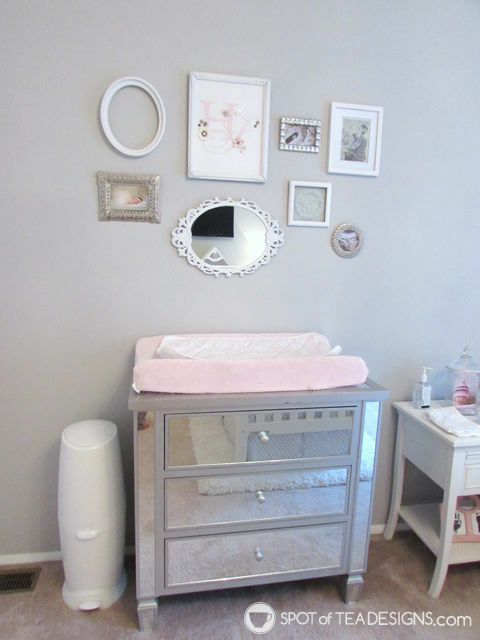 Harlow is changed daily on top of this mirrored silver dresser, purchased at Home Goods. Even her diaper disposal matches the décor in white! 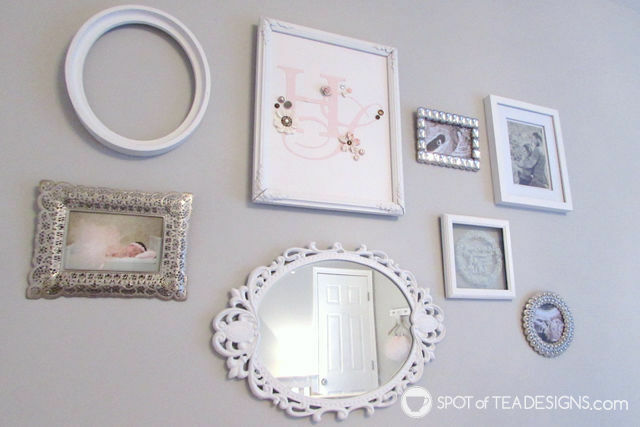 Above the changing area is a collection of purchased jeweled frames or perfectly mismatched ones that were unified with white paint. The one with the “H” on canvas is in a frame what once belonged to Alyssa’s grandparents! Along this same wall you’ll find a small end table and a beautiful plush rocker in a damask print. 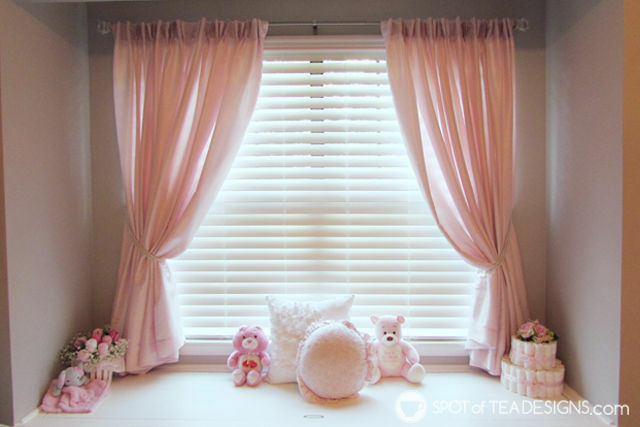 A large window allows light into the room with a big ledge for plush accessories. 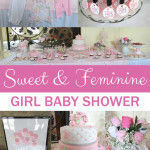 You may recognize the washcloth bouquet and diaper cake from her baby shower! 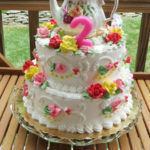 Other pieces came from Alyssa’s own childhood. 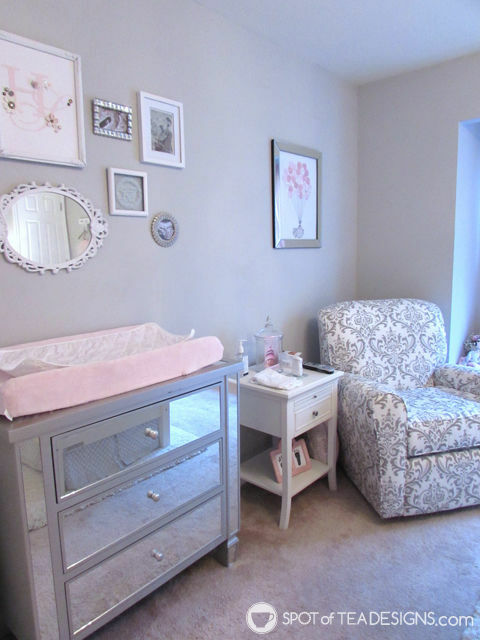 Along the other wall you’ll find a matching mirrored end table and the most adorable bookshelf built by Harlow’s daddy! 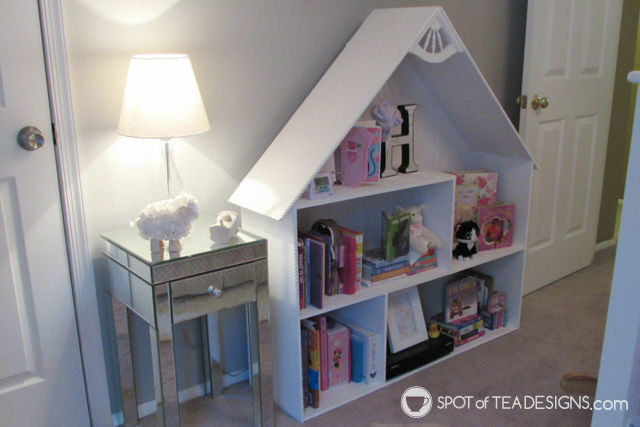 At 4 ft tall, this bookshelf currently holds a collection of books and trinkets but could later be used for playtime with dolls! 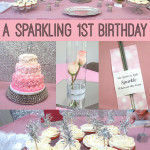 Alyssa added her fair share of crafty goodness which she or others made in this room! 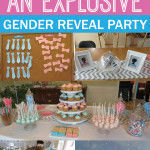 You may remember the “It’s A Girl Thing” tags used on the nail polish favors or the Alphabet Book created by guests at her shower. 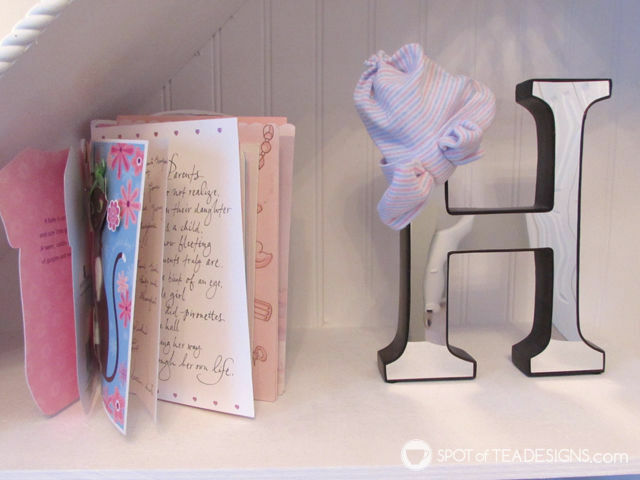 She also turned all her baby shower cards into a little accordion album which sits next to another mirrored accent, the letter H which holds Harlow’s first hat from the hospital. 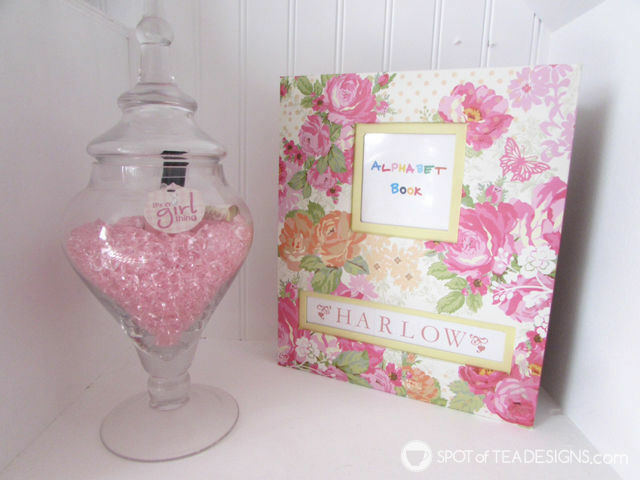 Over the plush rocker you’ll find the balloon bundle guest book from her baby shower. 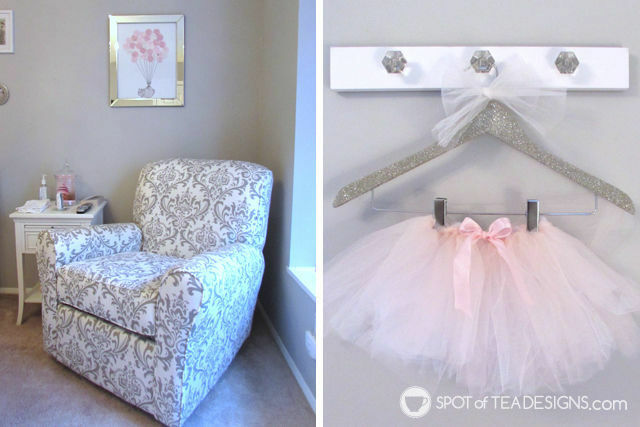 To keep the “sparkle” going in her room, Alyssa also glittered a plain hanger and hung a gifted pink tutu for a fun wall accent. 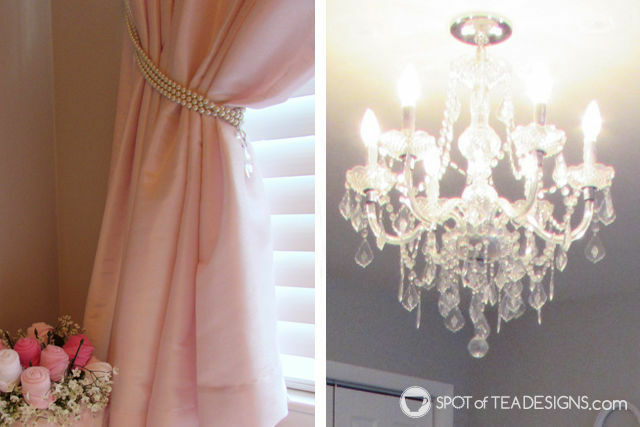 The curtains were tied back using pearl necklaces which is such a sweet detail! And here’s a nice close up of the sparkly chandelier that hangs over the crib. 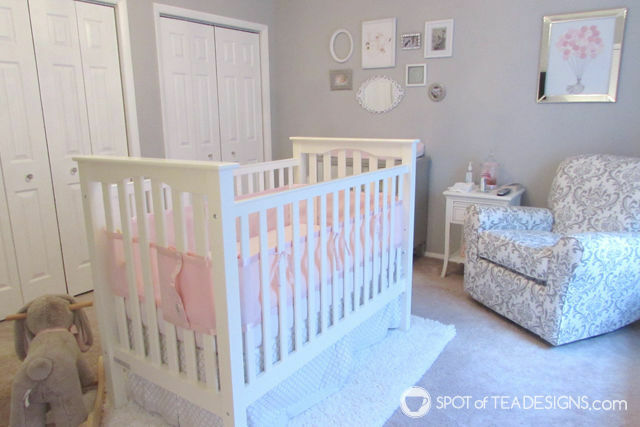 I think you could probably agree with me that Alyssa did an awesome job coordinating this beautiful space for her little miss!